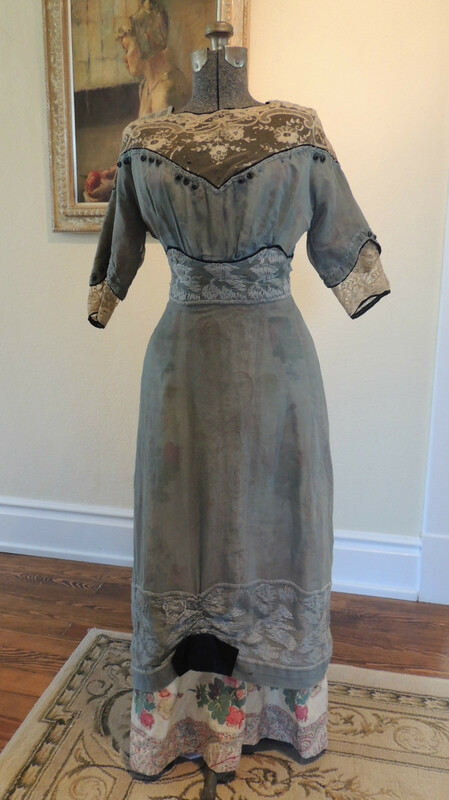 We just love this antique Edwardian dress ca 1915!! 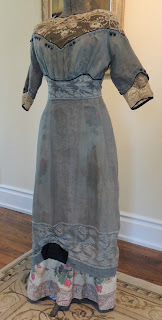 This beautifully designed dress is made with two layers: cotton print underneath and shear cotton pale green overdress! Overdress is embroidered with detail at the waist and hem, has antique french lace netting inset on the bodice and sleeves, and bodice and sleeves are decorated with crochet covered buttons! 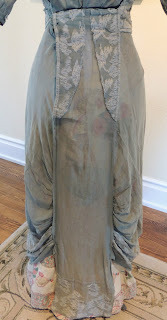 At the bottom front center of the overdress is a lovely cinching detail with black silk bow to match the black silk lining along the neckline, sleeves, and waist. The back of the dress has a pretty ruching detail along either side of a train-like panel. Hook and loop closures at the back have some missing loops and there are added snap closures at the top of the back. Overall, dress is in sturdy, wearable condition with some minor repair to closures!! 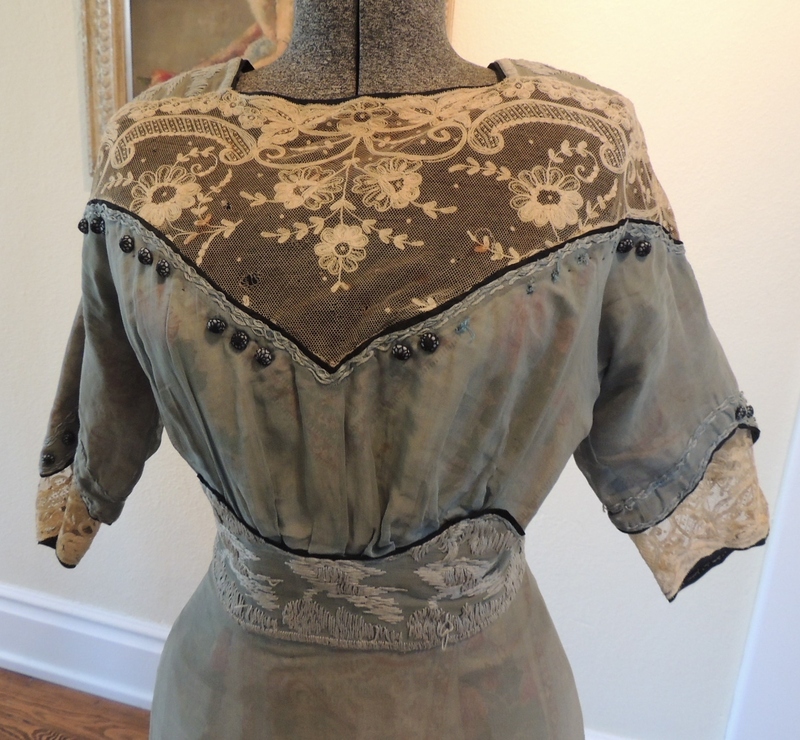 Antique dress is missing some decorative buttons on front neckline, and laced netting has fine holes and stains. Other faint stains appear on both under and overdress layers of cotton. There are some loose strings to the embroidery on overdress bottom hem. 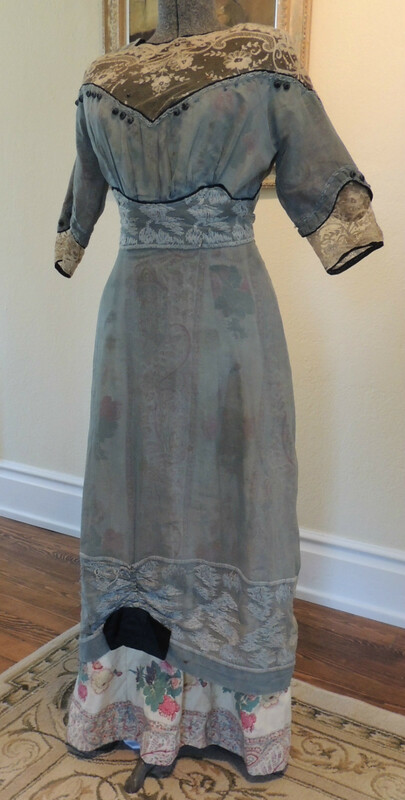 Dress measures approximately 54 inches tall from shoulder to bottom hem and approx. 16 inches from shoulder to shoulder seam at the back. Sleeves are approximately 14 inches from shoulder seam to sleeve hem and arm opening is approx. 9 inches around. Waist measures approximately 25 inches around. 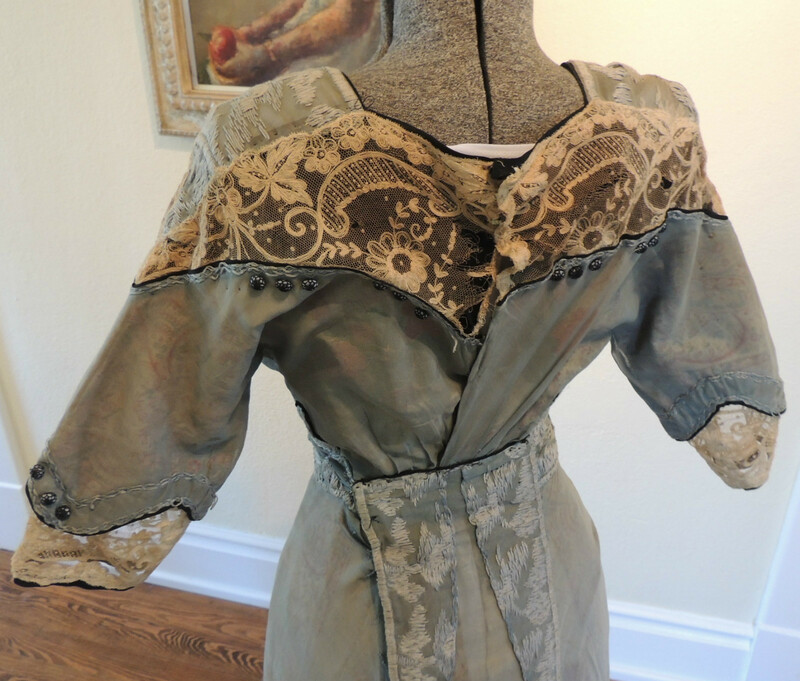 This Edwardian dress has such a cool design and is really just a fascinating piece!! Auction is for item as shown, dress mannequin not included. This looks earlier to me - 1908 ish.